Globally, 322 million people are suffering from depression (1); a common mental disorder that presents with depressed mood, loss of interest or pleasure, decreased energy, feelings of guilt or low self-worth, disturbed sleep or appetite, and poor concentration. It also leads to impairment of an individuals’ ability to function and carry out everyday tasks and responsibilities, and could lead to suicide (2). 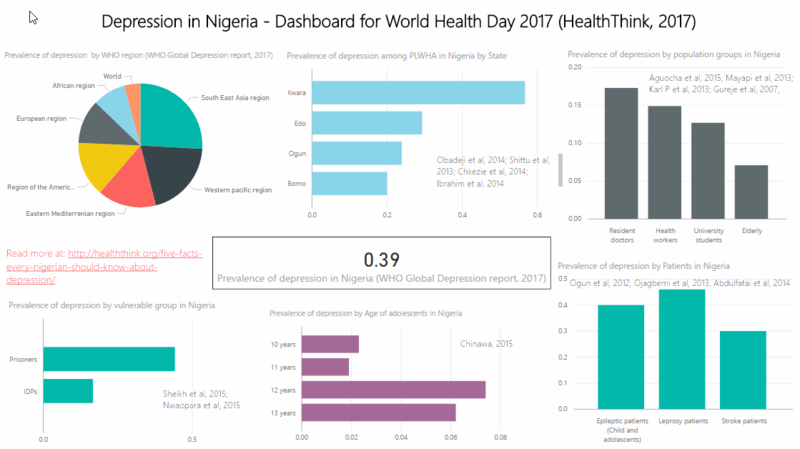 Today, as we celebrate World Health Day, with the theme “Depression: Let’s talk”, HealthThink hereby presents you with five important facts about Depression in Nigeria. Fact 1: Depression in Nigeria is more common than we think. Depression is a significant public health problem, and at a prevalence rate of 3.9%, 7 million Nigerians currently suffer from it (1). Several studies conducted among different populations have however reported a much higher prevalence. Studies conducted in Nigeria have reported the prevalence of depression among young adults, elderly and IDPs as 25%, 26.2% and 17% respectively (3 – 5). According to research conducted in various parts of the country, about 20% – 59% of people living with HIV/AIDS are depressed, with the highest prevalence reported in North – Central Nigeria (6 – 10). A study conducted in Western Nigeria in 2013 also reported that as high as 44.5% of clinical patients are depressed (11). Other studies conducted among patients with chronic illnesses like stroke, leprosy, and epilepsy have reported a prevalence rate ranging from 27.5% to 46% (12-14). The high prevalence of depression frequently reported among these populations suggests that it is a very common occurrence among people who face social adversity, and difficulties. Fact 2: Gender disparities exist in the prevalence of depression. Although depression is a common mental disorder globally, there exists a disproportionate prevalence among genders. According to WHO (15), the burden of depression is 50% higher in females than in males. In Africa, 5.95% of females suffer from depression, compared to 4.9% among males (2). Studies in Nigeria have also reported that being female is a significant risk factor of depression (6, 7). This disparity however comes as no surprise. Low socio-economic status, and intimate partner violence have also been reported as important risk factors of depression, and these factors are predominantly common among females (9, 16). In Nigeria, over 50% of women are illiterates, and not in the labour force (17), and 28% and 7% of females reported experiencing physical and sexual violence in their lifetime respectively (18). Many new mothers also experience a form of depression called postpartum depression. Studies have reported a prevalence of 14% to 20% among new mothers in Nigeria (19 – 21). Being a single mother and having a female baby are important risk factors for postpartum depression in Nigeria (22). This emphasizes the role that culture and society play in the prevalence of health problems in the country. Research has also begun to focus on antenatal depression, a form of depression among pregnant women. In a study conducted in Abeokuta, 24.5% of the pregnant women were depressed. About half of the pregnant women who were single were reported to have antenatal depression, and more than one-third of the women with unplanned pregnancies were depressed (23). This buttresses the need for strengthened advocacy and behavioral communications on access and use of family planning methods. Fact 3: People who are depressed usually do not get the help they need. Despite the availability of evidence based treatment, patients usually do not get the help they need to manage depression. In a study by Gureje et al, only 37% of elderly people with depression received any form of treatment (4). Often times, people suffering from a mental illness or disorder experience feelings of shame, stigma and discrimination. Furthermore, majority of Nigerians lack awareness about mental health, and available mental health services. With the abysmal lack of mental health services in the country, particularly in rural areas, financial difficulties pose an additional barrier to accessing health services (24). These barriers have long lasting consequences, as depressed patients who are untreated are more vulnerable to suicidal thoughts, and suicide. Depression is also linked to morbidity, poor child health outcomes, and mortality (1). Financial difficulties and social adversity have been associated with depression. With the high poverty rate of the country, and the difficulties faced by Nigerians every day, it is likely that the prevalence of depression among Nigerians will continue to increase. Stigma and lack of mental health services are some of the other various challenges usually faced in seeking and utilizing mental health services. A study reported that majority of health practitioners in a health care center in Benin City have limited knowledge of depression, with 78% of them facing difficulties in working with depressed patients (25). It is time we address these challenges and recognize that depression is a real problem to avert the consequences that are sure to follow. Mental health services should become an integral and functional part of primary health care, to ensure universal access. There is also a need for more mental health practitioners in the country in order to meet the needs of the ever growing number of people who will need to be treated. It is important that health workers actively seek to diagnose depression among patients and provide the appropriate health services to ensure they get optimum treatment. This implies that general practitioners and other health care workers need to be properly and regularly sensitized about depression and other mental health disorders. There is also a dearth of data on depression and other mental health disorders, emphasizing the need for more research in this area, especially in the community, as data is needed for appropriate health planning. The first step towards tackling these issues however, is raising awareness and talking about it. Now you know, let’s talk. WHO, (2017). Depression and Other Common Mental Disorders, Global Health Estimates. Gureje O, (2007). Epidemiology of major depressive disorder in elderly population in the Ibadan study of Ageing; a community based study. Sheikh et al. (2015) Correlates of depression among internally displaced persons after post-election violence in Kaduna, North Western Nigeria. Obadeji, Ogunlesi, Adebowale, 2014. Prevalence and Predictors of Depression in People living with HIV/AIDS Attending an Outpatient Clinic in Nigeria. Onyebuchi-Iwudibia and Brown, 2014, HIV and depression in Eastern Nigeria: the role of HIV-related stigma. Chikezie et al. 2013. Depression among people living with human immunodeficiency virus infection/acquired immunodeficiency syndrome in Benin City, Nigeria: a comparative study. Ojagbemi,et al, 2013. Stroke lesions and post-stroke depression among survivors in Ibadan, Nigeria. Abiodun, 2006, Postnatal depression in primary care populations in Nigeria. Owoeye, Aina and Morakinyo, 2005. Postpartum depression in a maternity hospital in Nigeria. Ajayi, O. T. (2016). Prevalence of Antenatal Depression and Associated Risk Factors among Pregnant Women Attending Antenatal Clinics in Abeokuta North Local Government Area, Nigeria. Depression Research and Treatment. Adewuya, 2005. Sociodemographic and obstetric risk factors for postpartum depressive symptoms in Nigerian women. Izibeloko O. and Uys L. (2013). Barriers to mental health services utilization in the Niger Delta region of Nigeria; service users’ perspectives. How Big Data Keeps Transforming Healthcare Malaria in Nigeria: Where are we now?